1. Forms: Asthma/Allergy; 2016-2017 Special Diet; Medication slip; and information on Bacteria Meningitis. These forms may be printed out. Links are below. Asthma Form, Allergy Form, Special Diet Form, Medication Slip Form, Diabetes Medical Management Plan Form, Bacterial Meningitis information, WISD Lice School Policy. 2. Remember to call the school nurse if you have questions regarding school health issues. Please help us care for your children at school by following these procedures. Keep the emergency card at the school up-to-date with your current address and phone numbers. We need to be able to reach you quickly if your child becomes ill or injured at school. All students must be up-to-date with their vaccinations. They cannot be in school when an immunization is due. If the doctor says they are too ill to receive the immunization at that time, we must have this in writing. Keep us updated on your child's medical conditions and needs. Let us know if he/she has any condition that requires special care. When your child has not been feeling well the night before, call the nurse's office the next day so that we can check on them during the day. The Texas Department of Health has communicable disease laws and guidelines that we are required to follow. These are meant to protect all students. Students should not be in school when they could be contagious to others, should be home recuperating, or are too ill to do school work. Fever over 100 degree; Child should be fever free for 24 hours without medication before returning to school . Rash of unknown cause or a rash that is blistered or has discharge needs to be evaluated by a doctor (includes chickenpox). Should be rash free or bring a doctor's excuse stating that they are not contagious before returning to school. Pink eye; needs to be seen and treated by a doctor. Signs of pink eye include red, itchy eyes often accompanied by a yellow discharge and/or crust on eye lashes. Vomiting or Diarrhea; or, if occurred during the night, should remain home the following day. Sore Throat should be evaluated by a doctor to rule out Strep; if has strep, must be treated with antibiotics for at least 24 hours and be free of fever before returning to school. Cough; if kept your child from sleeping the night before or is productive should stay home and be medically evaluated. Nasal discharge that is not clear (yellowish, greenish) or constant sneezing. Parents and doctors are encouraged to schedule all necessary medications for administration during non-school hours. If we need to give your child medication at school, please bring the mediation to the nurse's office. Medications should not be transported by the students on the bus. You might ask your pharmacist to divide the medication into two containers to prevent you from having to drop off and pick up medication everyday. Every medication requires written consent from the parent/guardian in order for the nurse to administer it during school hours. Prescription medication must be properly labeled with the student's name, medication, dosage, and time. Non-prescription medication must be in the original container (no baggies or envelopes). Your instructions must agree with the instructions on the bottle. Over the counter medications will not be given for longer than 2-3 days without a doctor's order. By law, licensed nurses are allowed and expected to refuse to give any medication that in their nursing opinion is not in the best interest of the student. All medication must be from the United States. 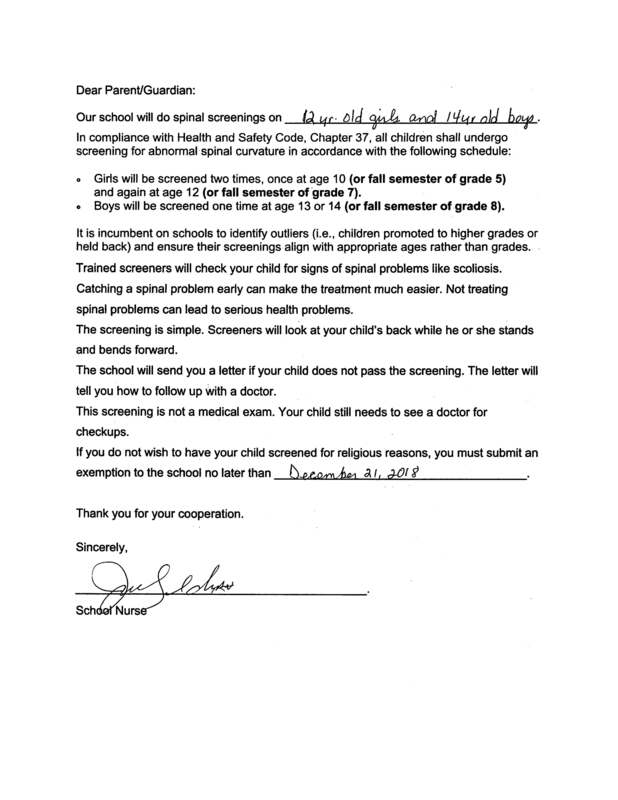 State & WISD Screenings: if preferred to take to own doctor notifiy the school nurse and please submit results to nurse.